A Baule mask, Ivory Coast, of the Sakasso area of hollowed, oval form, with scarification’s at the temples and cheeks, the finely hatched coiffure dressed as three, striated lobes with tufts on each side and with a domed lobe in the middle of the same manner, full-bodied lips beneath a slender nose, framed by bulging, half-opened eyes with vison slotes, pierced through, surmounted by prominent eyebrows; fine, aged patina, brownish to dark with remnants of oxidised kaolin, attachment-holes on the rim. In her important publication Baule: African Art, Western Eyes, Susan Vogel notes that “While the relative naturalism and consummate workmanship of Baule objects were praised at the outset, today these objects are appreciated for their subtle rhythms and a beauty that stops short of sweetness. To the Western eye, an essence of Baule style is a balanced asymmetry that enlivens while suggesting stability and calm. […] To an art historian, the most consistent feature of Baule art, and one expressed across the wide variety of Baule object types, is a kind of peaceful containment. 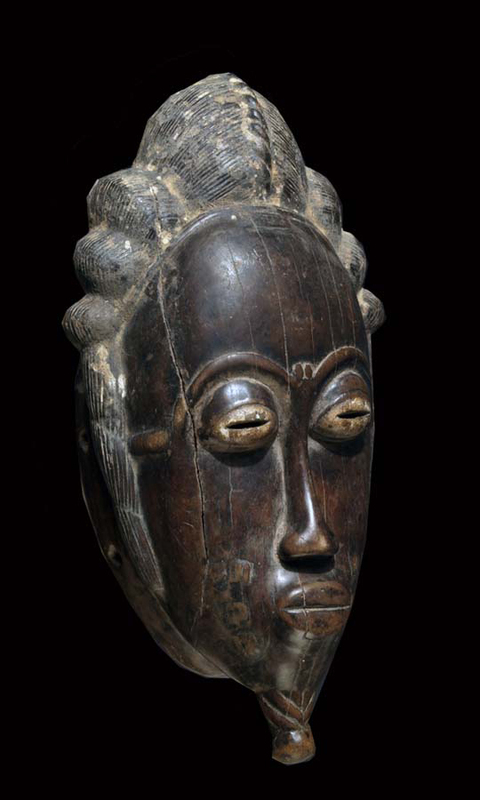 Faces tend to have downcast eyes and figures often hold their arms against the body, so that Westerners might feel that the mood of much classical Baule art is introspective.” (Vogel, Baule: African Art, Western Eyes, New Haven, 1997, pp. 26-28). related exemplare but more in the borderdestrict to Liberia. Sculptures of the Sakasso region, which are more well known, are arriving sometimes on the market, but they also become rare nowadays.